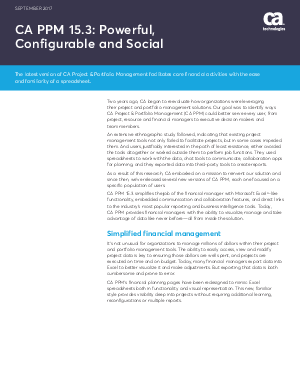 Two years ago, CA began to reevaluate how organizations were leveraging their project and portfolio management solutions. Our goal was to identify ways CA Project & Portfolio Management (CA PPM) could better serve every user, from project, resource and financial managers to executive decision makers and team members. CA PPM 15.3 simplifies the job of the financial manager with Microsoft Excel®-like functionality, embedded communication and collaboration features, and direct links to the industry’s most popular reporting and business intelligence tools.